Thanks for checking out our auctions! Five-Star Service is our Goal! Thanks so much, Beth & Mary. 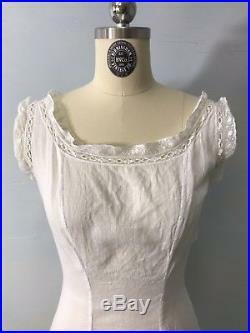 Description: victoria Edwardian full sip with lace trim around the neck and sleeves. 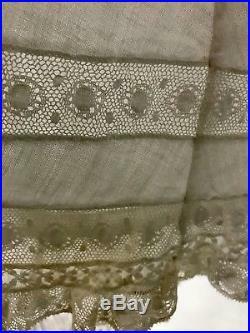 A line skirt with a wide flounce around the bottom 13" deep and 50" wide at the top and 64 around the bottom. 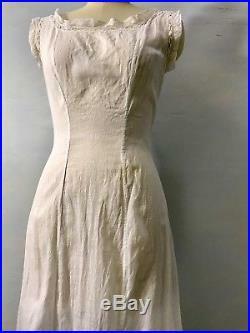 Length- Neck to Hem: 50. Condition: Very good, small holes in 1 area of the flounce and some age discoloration. Please use the zoom function on the photos to see up close details, and please feel free to ask any questions. Please see our condition guide below. Mint- As perfect and pristine as it was originally. May have never been worn and tags may still be attached. Near Mint- Shows only the slightest bit of wear on an otherwise perfect garment. This means it may have only been worn once or twice. 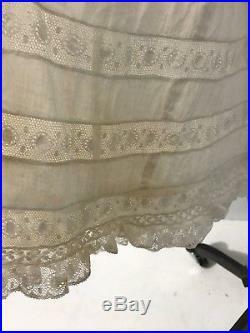 Many of our wedding gowns, cocktail dresses and special items are in this condition. Excellent condition means totally sound in structure and appearance. Any wear is the result of having been worn occasionally, but its clear that the garment has been well cared for and stored. Very Good condition means wearable with some minor flaws. 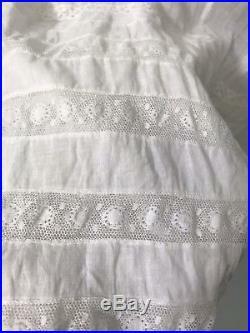 The flaws could be stains, torn seams, or a fallen hem, for example. Buttons may be missing, but ideally there are still some to either match or inspire a replacement. 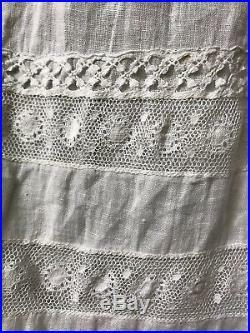 Its often possible to take a garment you find in this condition and mend, alter, or specially treat stains to turn it into a garment in Excellent condition. Many of my own dresses are in this condition. Overall the garment is good, and any flaw still standing doesnt prevent you from wearing and enjoying it. Good means wearable, but the dress is no longer in pristine condition. In this case, you normally couldnt achieve excellent condition even if repairs are made. That said, often if you love a piece, you will just accept the flaws. 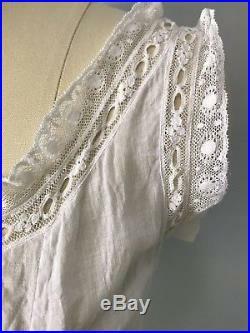 These are often vintage clothes that were simply well loved and thus well worn in their day. Other times it may be a case where the garment just wasnt stored very well. Poor- multiple holes, tears, stains, etc. Garment is unwearable, but good for study/ pattern. Even with garments in Excellent and Very Good condition, you should expect to at least dry clean and do minor repairs on each garment before it is worn. Stains are often found in vintage and it's up to you how much you want to try and remove them. Consider that the more aggressive the treatment, the greater the odds you may do damage to that otherwise beautiful garment. Sometimes it's not even possible to remove it. Honestly, a few stains here and there on vintage doesnt bother me. I truly only see the artistry of the dress, and trust me this is pretty much the case for everyone who will see it. International Buyers - Please Note. 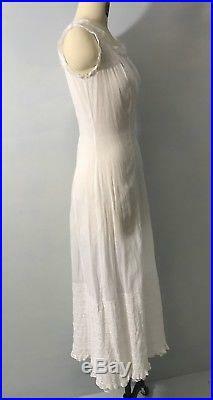 The item "CA- Antique vtg Victorian Edwardian sheer white lace long slip dress gown XS/S" is in sale since Monday, August 13, 2018. 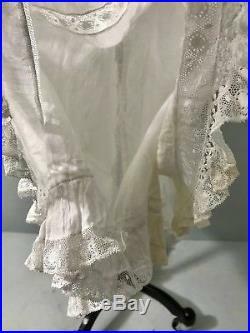 This item is in the category "Clothing, Shoes & Accessories\Vintage\Women's Vintage Clothing\Lingerie\Slips & Petticoats". The seller is "birminghamvintageco" and is located in Birmingham, Alabama. This item can be shipped worldwide.